Ocean Creek Lodges 3 is a North Myrtle Beach resort within a much larger North Myrtle Beach resort. Ocean Creek Lodges 3 is part of the Ocean Creek Resort, which extends from Highway 17 in the Windy Hill section of North Myrtle Beach, South Carolina all the way to the white sandy beaches of the Atlantic Ocean. It is a marvelous gated resort community that features a wide array of amenities. There are two buildings that comprise Ocean Creek Lodges 3 and between these buildings is a welcoming sun deck that surrounds a bright blue swimming pool. Filled with lounge chairs and surrounded by trees and landscaping, this pool deck is a favorite place to hang out during families’ North Myrtle Beach vacations at Ocean Creek Lodges 3. But there is much more to a North Myrtle Beach vacation at this resort because there are swimming pools scattered throughout the resort. Swim in a pool that is on the oceanfront or swim in a pool that is indoors. 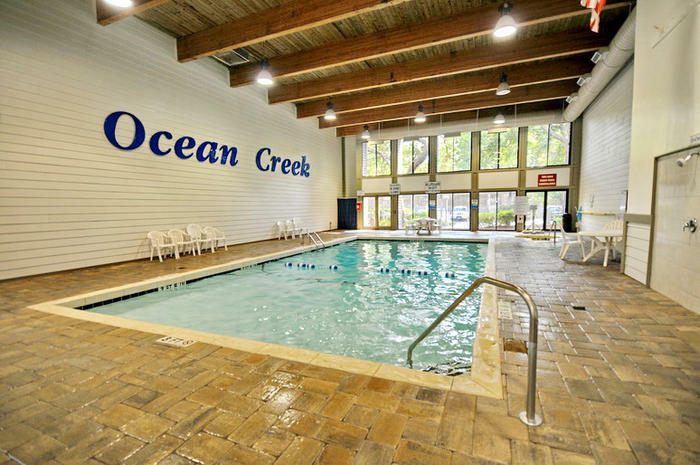 There is a swimming pool at Ocean Creek that is partially indoors and partially outdoors. Kids love this feature. At Ocean Creek Lodges 3 you may select a one-bedroom, one-bath North Myrtle Beach vacation rental. These charming North Myrtle Beach condos are quite spacious and are filled with comfortable furnishings and amenities. There are sleeping accommodations for four people in these North Myrtle Beach condominium rentals. Delight in the living room that opens to a screened balcony. One whole wall of the living room is comprised of sliding glass doors and windows. It allows your family to see outside to the greenery and trees while remaining in the comfortable air conditioned North Myrtle Beach rental. There is a dining area in these North Myrtle Beach vacation rentals that is adjacent to the kitchen. Each kitchen at Ocean Creek Lodges 3 is nicely furnished with full-size appliances. Bake some hot-from-the-oven cookies for your family during your North Myrtle Beach vacation and take advantage of the dishwasher when it comes time to clean up. Keep your drinks icy cold in the refrigerator and forget about having to live out of a cooler during your North Myrtle Beach vacation at Ocean Creek Lodges 3. Laundry facilities are on each floor at Ocean Creek Lodges 3. When you play hard in North Myrtle Beach during your family vacation sometimes it becomes necessary to do a load or two of laundry. It is an easy job to tackle at this North Myrtle Beach resort. Elliott Beach Rentals is not affiliated with onsite management or the HOA of Ocean Creek Lodges 3.